The National Endowment for the Humanities (NEH) has awarded the Ransom Center a $18,900 grant to preserve and enhance access to the Ransom Center’s non-commercial sound recordings. 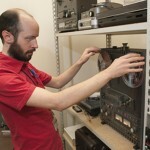 The grant allows the Ransom Center to complete a preservation survey of more than 13,000 archival sound recordings to establish and document preservation digitization priorities, processes, and standards to enhance access to these research materials. A majority of the recordings are unique and were made for private, non-commercial use. The content varies widely but includes literary spoken word, conference proceedings, dictated notes and letters, field recordings, structured interviews, lectures and readings, musical performances, radio broadcasts, rehearsals, telephone conversations, dictated drafts of writings, and even therapy sessions and psychic readings. Recordings in the collection belong to some of the twentieth- and twenty-first-century’s most notable writers, artists, and performers including Stella Adler, Neal Cassady, Andre Dubus, David Douglas Duncan, Norman Bel Geddes, Spalding Gray, Denis Johnson, Ernest Lehman, Norman Mailer, Bernard Malamud, Gerard Malanga, David Mamet, Nicholas Ray, Ross Russell, David and Jeffrey Selznick, Anne Sexton, Isaac Bashevis Singer, Warren Skaaren, Ted Spagna, Gloria Swanson, and Leon Uris. Of the more than 13,000 audio recordings cataloged in the Ransom Center’s Sound Recordings Collection database, 2,700 have been digitized and are available for streaming onsite in the Center’s Reading and Viewing Room. 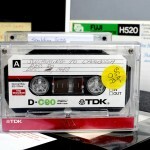 A long-term goal is to place the Sound Recordings Collection database on the Ransom Center’s website, providing patrons access to existing sound recordings. Upon completion, the project will serve as a model for a follow-up project to survey the Ransom Center’s archival moving image materials. Click on thumbnails to view larger images. 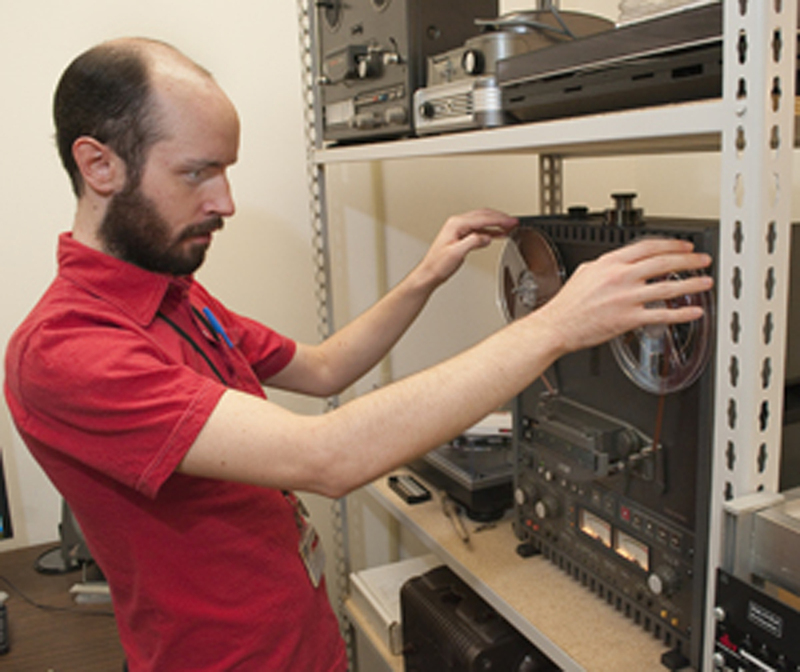 Eric Cartier, a graduate student in the School of Information, works with an audio reel of William Faulkner reading his own short story “The Bear.” Photo by Pete Smith. 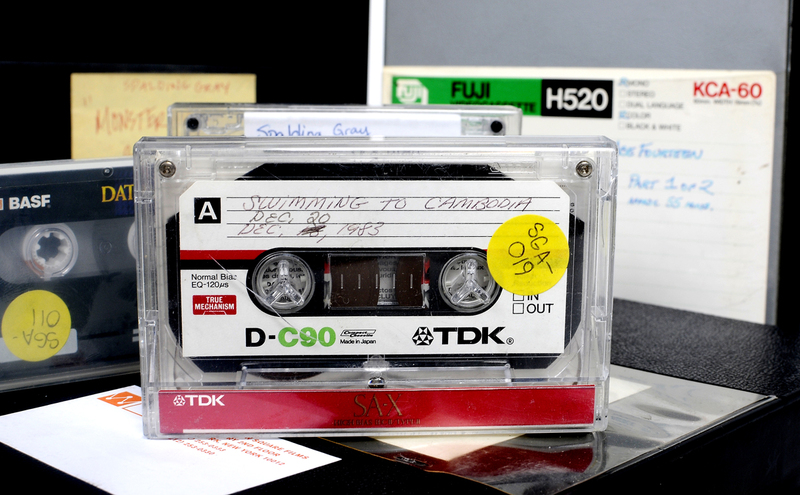 Audio cassette and video cassette tapes from the Spalding Gray archive. Photo by Anthony Maddaloni. Tisdale is responsible for identifying, planning, and implementing strategic public affairs activities and programs that range from media relations to social media at the Ransom Center.